It is sometimes difficult to allow your child to make the mistakes it takes to master a task at hand. All too often it is more work to clean up after your child has “helped” rather than just doing the task yourself. However, it is important to do your best to let your child try and complete any activity they are engaged in. Children have the will; it’s just the skill that’s needs improvement. By disrupting your child’s work you may inadvertently give them the signal that they are not good enough. Positive self esteem and independent thought are nurtured by positive experiences to actions in the child’s world. The activities that we take for granted as adults are of the most importance to a child. The genuine joy a child receives from mastering tasks, such as dressing themselves, promotes a strong sense of self. The key for parents is patience and planning. 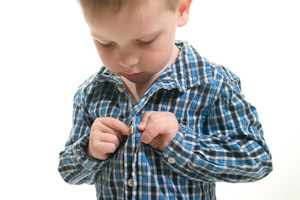 Do you allow a few extra minutes for tying up shoes, buttoning coats or finding mitts before heading out the door? Do you have a plan for requests to help in the kitchen; a wash bin on a chair for dishes, or a small table to help prepare food? And, yes, can you wait patiently while your child struggles with the task at hand? A good friend of mine rearranged her kitchen so her grade school girls could complete all the mealtime chores that were required of them. The plates, glassware and other items needed for setting the table were all put in lower drawers rather than up above the counters. The girls never had to ask for help to complete their work that they were able to do. In issues to come we will offer age-appropriate tasks around the house for your preschool child. Blog, Independence, Sense of Self Independence, Self Esteem. permalink.